The tide had started to fall back here on Campfield Marsh, I casually glanced out towards the viaduct and saw what appeared, at fist glance, to be 2 people- but not quite. My curiosity was aroused. 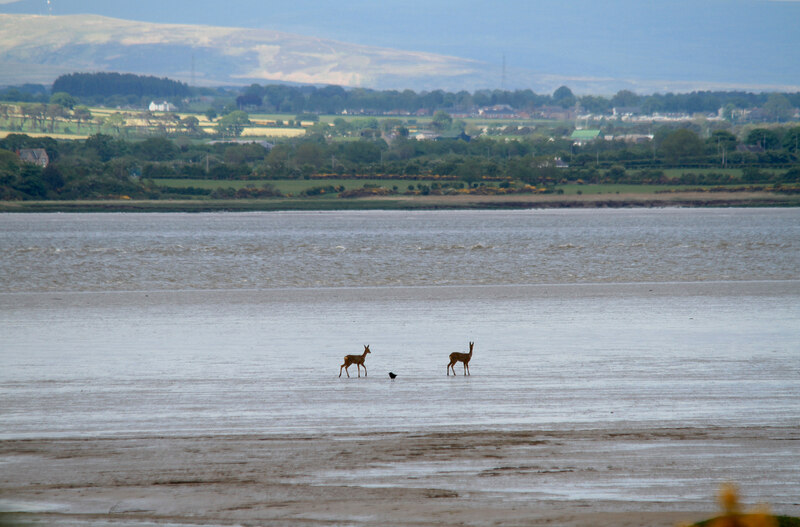 So I focussed up the scope and they surprisingly turned out to be two Roe Deer. Had previously never seen them out on the sands - on the marsh, but not on the sands! At first glance they seemed to be quite disorientated - on further observation, they were ranging up and down on the edge of the tide and occassionally wading in. After watching them for 15 minutes, it became clear that they were intent on crossing the Estuary into Scotland. At times, they waded in up to the top of their legs and I began to wonder if they were going to swim for it but each time they retreated. It did begin to look as if they had done this before! We watched for a further 45 minutes but with no attempt taking place - I don't blame them as there was a considerable rip on the tide in the middle of the channel. All the time they were pushing back into the Estuary and they finally disappeared from view round the end of the viaduct.. I assumed from their perseverence that they were still intent on crossing. Interestingly, birds were interested in them. At one time 5 Crows and some gulls were in close attendance. We have lived here on the marsh front for 25 years and have never, in that time, observed this before. I would be interested to know if anyone else has seen this phenomenon previously? One wonders what was the driving force behind this apparent migration? Had there, perhaps, been a disturbance on the moss, presumably, from whence they came? Could there be pressure from other deer in some form or other, or were we just observing something that was a regular phenomenon? Many years ago (about 1993 I think) I was carrying out a low tide count of feeding waders on the Solway and was walking along close to the waters edge way out in the middle of the estuary (not to be recommended without checking the tide times) when I saw what I first thought must be two otters. On closer inspection I realised that they were roe deer swimming across the channel from Scotland to England. They eventually reached the shore and then moved quickly moved across the sand to the saltmarsh where I lost sight of them. Presumably they eventually reached the relative safety of the peatbog. Do you think that after 18 years they have decided to go back !!!! !